​​The chronological framework developed for the Champotón Regional Settlement Survey was based on type-variety and modal analysis of a sample of 76,315 sherds derived from 15 sites documented during reconnaissance and testing phases of the project, including 99 test excavations and 179 surface collections. This preliminary regional chronology is part of a more comprehensive ceramic chronology currently being developed in collaboration with Donald Forsyth. The ceramic and settlement pattern data reveal a pattern of regional occupational continuity from the Middle Formative through Colonial Period, with periods of intra-regional demographic shifts following the end of the Late Formative, Late Classic, and Early Postclassic Periods. Initial sedentary populations are evident by the Middle Formative Period (Champotón 1A and Champotón 1B), with earliest occupations localized along the coastal margin and at the mouth of the Río Champotón. 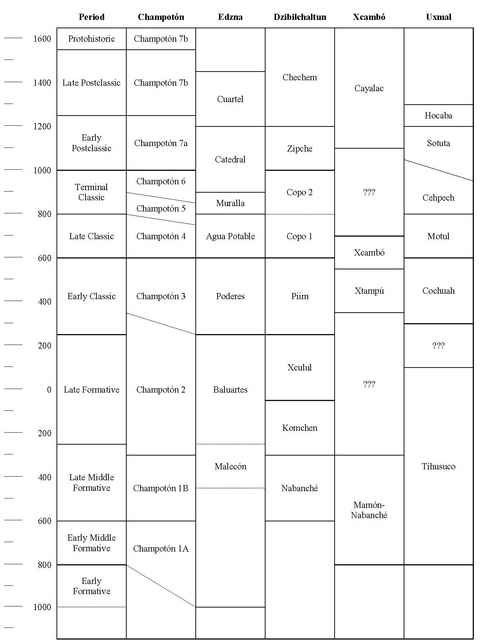 A dramatic increase in populations and sociopolitical complexity took place across the region in the Late Formative period (Champotón 2). There is little evidence for strong links with the Central Maya Lowlands during the Early Classic – as reflected in the rarity of Tzakol Sphere ceramics – indicating that western Campeche was poorly integrated into the political networks of the Petén. By the beginning of the Late Classic period (Champotón 4) there was a major change in regional settlement patterns throughout the Río Champotón drainage, with a shift from dispersed coastal settlement to urbanization at Ulumal and San Dimas. Ceramic links with the city of Edzná reflect political and economic ties, likely facilitated by the canal system and Río Champotón waterway. By the end of the Late Classic period (Champotón 5), Ulumal and San Dimas both ceased to function as important political centers. Populations shifted to a dispersed settlement pattern along the coast. During the Postclassic period (Champotón 7) there was a final process of urbanization, with populations concentrating around the cities of El Zapote and Champotón. By the end of the Postclassic regional populations concentrated at the mouth of the Río Champotón, culminating in the port city and regional state documented in Spanish sources.